Once again various things have grabbed my attention and caused me not to post as regularly as I would like. This time around it has been the writing of a datasheet dealing with evidence for Early Medieval lucets and lucet braiding. I have posted the full text here, but it is also available as a pdf as well (lucets in EM). This is not entirely my own work and was a collaboration between myself and another member of our re-enactment society. Lucets are simple tools consisting of an object with (usually) two prongs. They are used create small braids that are square in section, quite strong and are slightly “elastic”. Due to the nature of lucet made braid, the thread used to make the braid does not have to be pre-cut to a particular length and thus a lucet can be used to create an exceptionally long braid. However, as a looped technique, the braid will unravel if it is cut across its length. Are lucets authentic for Early Medieval re-enactment? Lucets are ultimately nothing more complex than a forked stick, and thus many people could potentially make lucet braid without a specific tool simply by using any twin pronged implement (Hald 1975). As such there are no definite finds of lucets, though there are a number of probable and possible examples. Any definitive evidence for the use of lucets must come from examples of the braid itself. However, as preservation conditions are not always ideal for textiles, examples of lucet braid are also rare. Despite the difficulty of pinning down lucets absolutely, there is enough evidence (described below) to suggest that lucets probably were used in pre-Conquest Britain, though they are unlikely to have been common. However, an important point to note is that while the name “lucet” has been applied to various tools for making square section cord, the later Renaissance and similar lucets are quite different to examples from the Early Medieval. The example shown below (Fig 1), and variations of that style, are most certainly not authentic Early Medieval types. As mentioned above, textiles are not always well preserved on archaeological sites and so examples of braid are quite rare, but there is a grave from Gotland, Sweden (late 11th C) that has two possible lucet braids present, see Fig 2 taken from Petterson (1968). Having decided that these could be lucet braids, Petterson then looked for examples of possible lucets from the period and experimented with replica lucets and came to the conclusion that while it could not be definitively proven (as the original cord could not be unraveled to check the internal thread structure) it was highly likely that the cord from the grave was made with a lucet (Petterson 1968). Fig 3 reconstruction of how the lucets finds could be used to replicate the cord from the Gotland grave (Petterson 1968). This is a standard theory for how early lucets were used, whereby the braid is fed downwards through the hollow bone as it is produced on the points. Unlike Scandinavia though, there are no positive finds of lucet braids from Britain, from the Anglo-Saxon period through to the Medieval (Walton-Rogers 1997). Given the lack of solid evidence for the prolific existence of lucet made cord, it must also be considered that while the braid itself may be authentic for the period, it was possibly imported into Scandinavia and possibly Britain rather than made internally. It known that trading routes from large settlements such as Birka and Hedeby extended far to the East (Graham-Campbell 2001) and thus it is not impossible that these were imported items. Where there is a dearth of evidence for the braids themselves, there is substantially more evidence for objects that could be lucets. When dealing with these objects, it must be stressed that they are all “possible” lucets. None have definitely been confirmed as being used as lucets and the fact that the form is so varied would suggest that even if some are for cord making then others are not. In addition to the various finds listed below, there are also a number of other finds that are occasionally suggested as lucets by re-enactors but can be shown quite conclusively to not be lucets. The three most commonly cited finds are listed below. 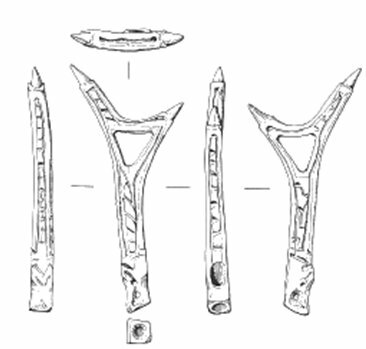 These so called “tridents” are cut long bones (usually metapodials) that appear similar to the find from Thetford (Fig 4) except with three points rather than two. However, more recently excavated examples of these that have been studied (such as Oost-Souberg) have been found to not show wear patterns in the centre of the tube that the excavators believed would arise from cord making (Lauwerier & Heeringen 1995). Sites such as York have also produced worked bone in the form of trimmed cattle nasal bones with two prongs. Despite a few examples showing some wear around the prongs, there is no reason to believe that these are lucets and the general consensus is that they are not for cord making (MacGregor 1982, 1999, Walton-Rogers 1997). A few sites in Norway have produced a series of long “U” shaped objects of whalebone. While these have been appropriated as lucets by some re-enactors due to their shape, the size of these items (over 20cm long) means that they are impractical for cord making. The original identification of them as fishing implements is most likely true, especially as their have parallels in recent modern fishing tools. As well as the finds that have been mistakenly claimed as lucets by re-enactors, there are a number of finds that probably are actually tools for cord making. These are listed below with a brief description of each. Excavations at Thetford uncovered this object, which was positively identified as a lucet by Elizabeth Crowfoot (Rogerson et al 1984). It is remarkably similar to the bronze find from Hossmo, Sweden (Fig 5 and Reuterdahl 2011). The bone used is a sheep metapodial. Dating from Thetford is not the clearest, but this most likely dates from the 10th-11th centuries. Recent excavation at Hossmo church in Kalmer County, Sweden (Reuterdahl 2011) have unearthed this possible lucet in bronze. 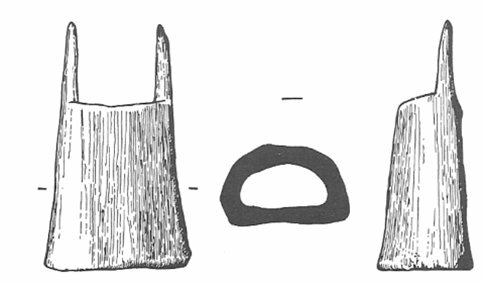 As a very simple design for a bone lucet has been illustrated above (Fig 4) it is possible that this is a skeuomorph of the bone example (a skeuomorph is a copy of an item made in a different material from the original), especially as this is known to occur with other artefacts (MacGregor 1985). A find from Lund is probably the most likely of all potential lucets to actually be one. As well as its form, it has an runic inscription that possibly reads “tinbl bein”. Various translations are possible including “thread bone” or “twining bone”. The finds associated with the context of the lucet suggest a date of the late 11th C (Blomqvist 1963).. As with the Thetford find, this appears to be made from a sheep metapodial. Fig 7 Bone lucet from Lund, Sweden. 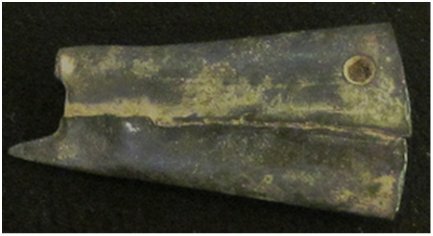 11th C.
This heavily worked antler object from York has been posited as a possible lucet. The suggestion is because of the fork and that the tips of the tines are worked, though the evidence is no more substantial than that (MacGregor et al 1999). Based on the decoration this is dated to the 9th-10th centuries. Blomqvist R., (1963). Thulegrävningen 1961; en berättelse om vad grävningarna för Thulehuset i Lund avslöjade. Lund, Skanska Centraltryckeriet. Council of Europe “Cultural Routes” Programme. The World of the Vikings, CD-ROM for Windows. York Archaeological Trust, National Museum of Denmark, Multimedia Management and Past Forward, Ltd., 1994. Graham-Campbell J., (2001). The Viking World. London, Frances Lincoln Ltd.
Hald M., (1975). Flettede Baand og Snore. Gyldendal. MacGregor A., (1985). Bone, Antler, Ivory and Horn. The Technology of Skeletal Materials since the Roman Period. London, Croom Helm. Walton-Rogers P., (1997). Textile production at 16-22 Coppergate. York, Published for the York Archaeological Trust by Council for British Archaeology. So there you have it, some brief research on lucets in the Early Medieval. I am currently working on an assortment of bone pins as well as some other interesting bits and pieces, all of which will be posted sooner or later (probably later). Many thanks for your work!!!!! !